When I visited Daylight Center and School as a board member six years ago, I was privileged to create bonds with Director Michael Kimpur, his family, his tribe, and the children of Daylight. I participated in the initiation rites of Michael’s tribe, the Pokot, and joined my then fiancée, Becca, in a traditional marriage ceremony. I got to see firsthand the tireless dedication of Daylight’s teachers and staff, and witness the possibilities created in the lives of children as Daylight provides both an education and a place of belonging. 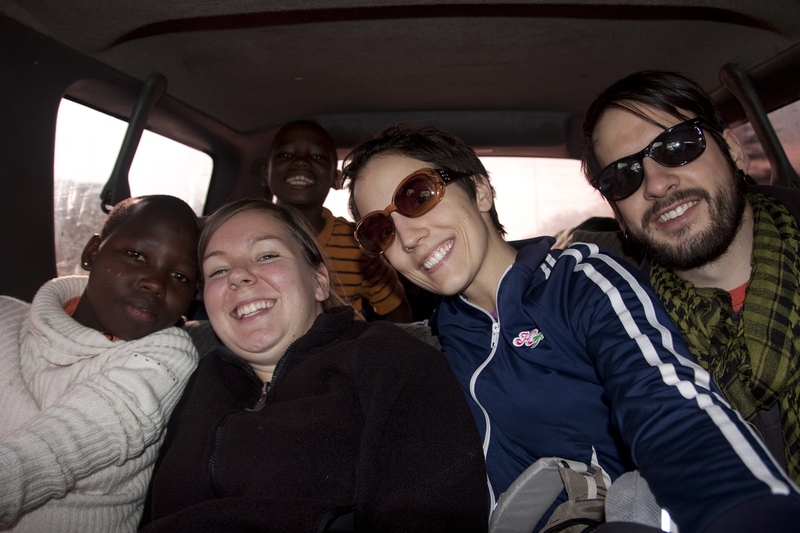 From right to left – Andrew and his wife Becca Ulasich, Emilie Robinson, and Chelimo Kimpur driving with Daylight students. Since that time I was an Event Supervisor with Feed My Starving Children, I traveled the world with Becca for nineteen months, volunteering in places of violence and conflict, and I completed a Masters degree in Peace and Conflict Studies. Today, I’m thrilled to share the ties I made six years ago are drawing me back to Daylight as U.S. Director of Operations and Fundraising. I want to thank Elodie Lee for her years of service to the children of Daylight and for continuing to establish the foundation on which Daylight will be supported and strong for years to come. I am excited to work alongside US Director Nathan Roberts and US Board and to meet our US partners and donors. My other big news is that two months ago, Becca and I had our first child. As we adjust to a new life, I think a lot about building the kind of world we want for him and for all of our children around the world. My hopes for my child are the same as my hopes for our kids in Kapenguria, Kenya: a safe space of love and belonging, the opportunity to pursue their dreams, and the vision and imagination to contribute to a better world. It’s an honor to rejoin Daylight Center and School to that end. I look forward to continuing our partnership on behalf of our kids at Daylight. We are Over Half Way to Our Pledge Goal for the 2018 School Year! 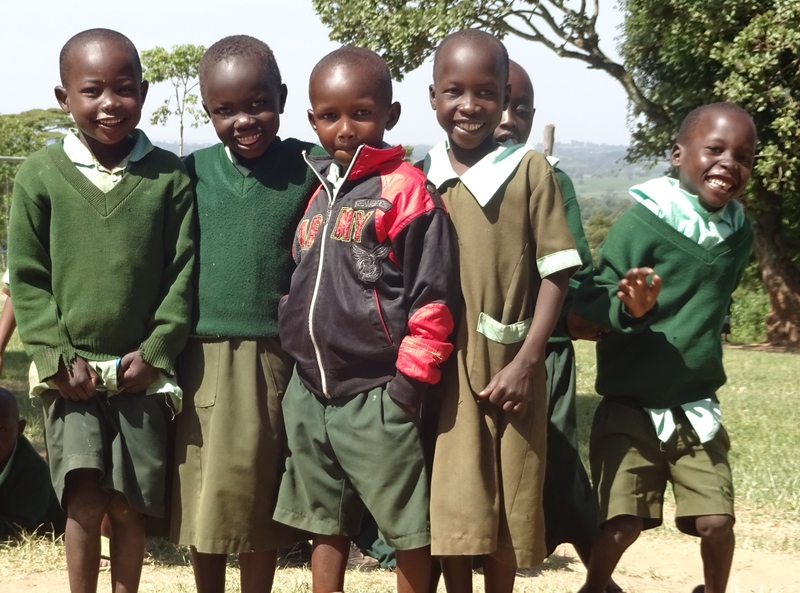 In January the students of Daylight Kenya begin a new school year. New classes and new challenges and a lot of excitement. Will you pledge to support Daylight’s students this year? Each month our U.S. partners help us to send $6,000 to support the school with their generous gifts. In addition to special projects like finishing classrooms, adding windows, and getting new bunk beds – your gifts are helping us to provide food, school supplies, teacher salaries, and the everyday needs of Daylight’s students. This year we have 31 generous families that have pledged to give to Daylight monthly. We are just over halfway towards our goal for the year for 2018 pledges. We need 30 pledges of $100 per month to reach our goal. Will you pledge to help Daylight meet these basic needs for our students? Thank you for pledging your support for Daylight in 2018 and helping us to feed, educate, and grow bright leaders in Kenya. 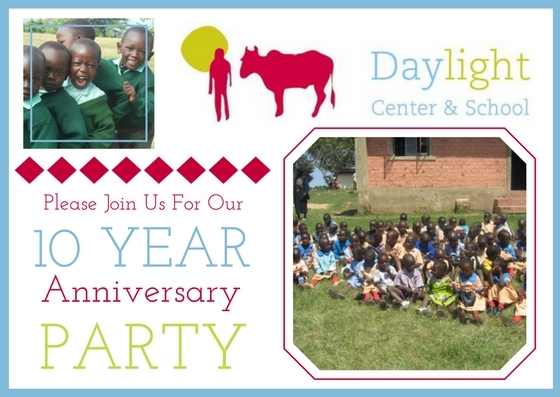 Join us for Daylight’s Ten-Year Anniversary Party on Feb 11th! We are planning a joyous celebration of everything the last ten years have brought. Our Kenyan director, Michael Kimpur, will be in Minnesota to celebrate with us and share inspiring stories of the amazing young people who have studied at Daylight. The event will be an open house with light brunch refreshments and a short program at 2:30 p.m.
SAVE THE DATE: Daylight 10 year Anniversary Party with Michael Kimpur Feb 11th! 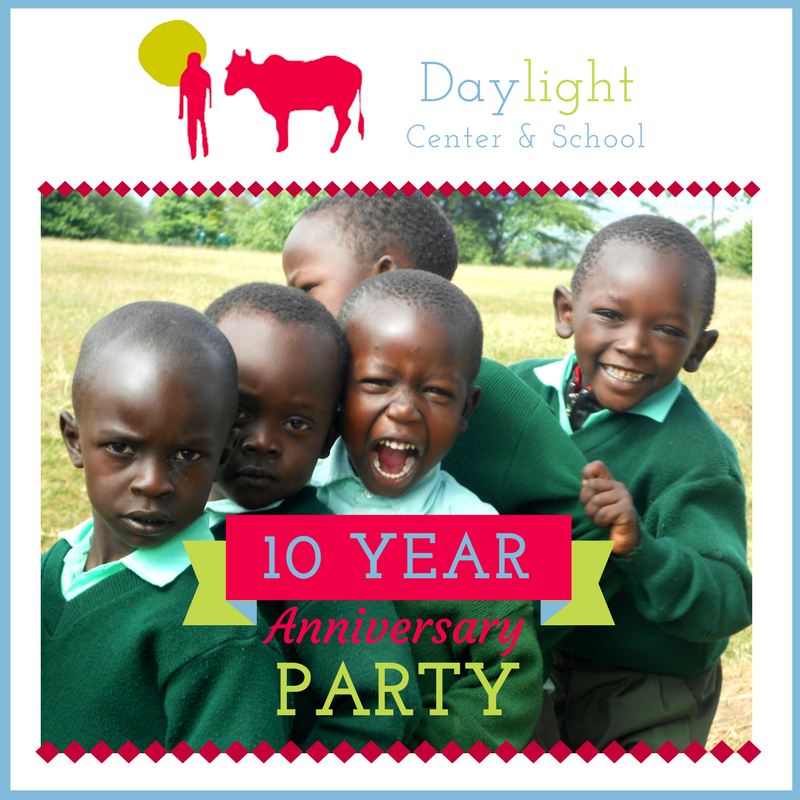 Join us for Daylight’s Ten-Year Anniversary Party on Feb 11th! We are planning a joyous celebration of everything the last ten years have brought. Our Kenyan director, Michael Kimpur, will be in Minnesota to celebrate with us and share inspiring stories of the amazing young people who have studied at Daylight. The event will be an open house with light brunch refreshments and a short program at 2:30 p.m.
We can hardly believe that Daylight has been around for ten years, but we have come a long ways. We began Daylight as a way to support thirty children whose parents had died. During our first month, January 2007, we had thirty kindergartners meeting in a church Sunday-School classroom. Our first month’s budget was $250, which all came directly from our U.S. Director, Nathan Roberts, to his college roommate, Michael Kimpur. Since then it has been an amazing journey with so many adventures. With your help, and the help of so many Kenyans and Americans working side-by-side, we have graduated two classes into high school! And are now educating 400 students on two campuses! Please join us at our anniversary party to help celebrate this incredible school and the people who make it special. “I want to give computers to kids so they can study math and English,” Jedida says smiling. She is in 7th grade at Daylight, and she wants to be an computer engineer when she grows up. “Math is easy for me and I want to start studying engineering on computers.” At school she loves playing hide and seek with her friends in the fields and bushes around Daylight Kapenguria’s twelve-acre campus. Jedida is blessed to have two supportive parents that she lives with in town. Her parents are great roles models of community service. Her father is a doctor and her mother is a nurse who serves at a small community clinic in town. She learned the importance of medical professionals when she was sick with a cold and had to miss school. 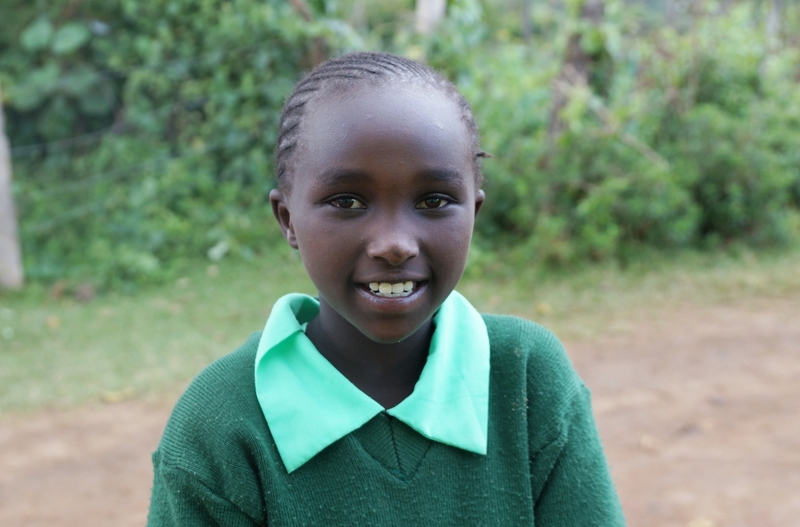 Jedida’s family contributes financially to Daylight to help pay for her education. On behalf of Jedida, her family, and her hide-and-seek buddies, we want to thank you for making Jedida’s education possible.